Boiler and Burner Technology Engineering for a Cleaner Environment. Hurst developed its first low emission (Low NOx) boiler in 1992, and has been incorporating new technologies to improve upon green boilers ever since. Research and development projects are maintained in-house, as we continually strive to provide boiler solutions to meet all federal and state requirements, while greatly reducing "greenhouse" gasses. 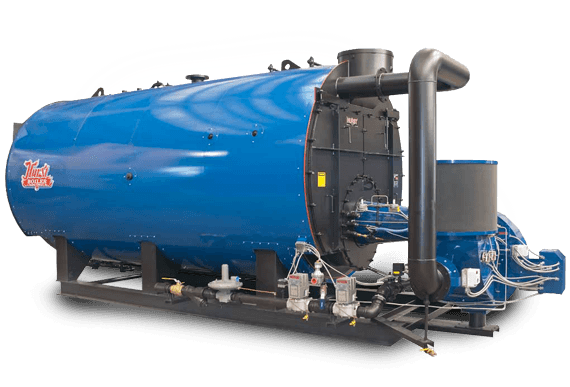 The Hurst Cyclone "Phase II" vertical tubeless boilers are available for steam and hot water applications. In addition, Hurst's state-of-the-art combustion technologies are engineered to meet the stringent requirements for California, including SCAQMD, utilizing natural gas for fuel. Environmentally friendly, these boilers are fully factory-assembled, piped, wired and tested.